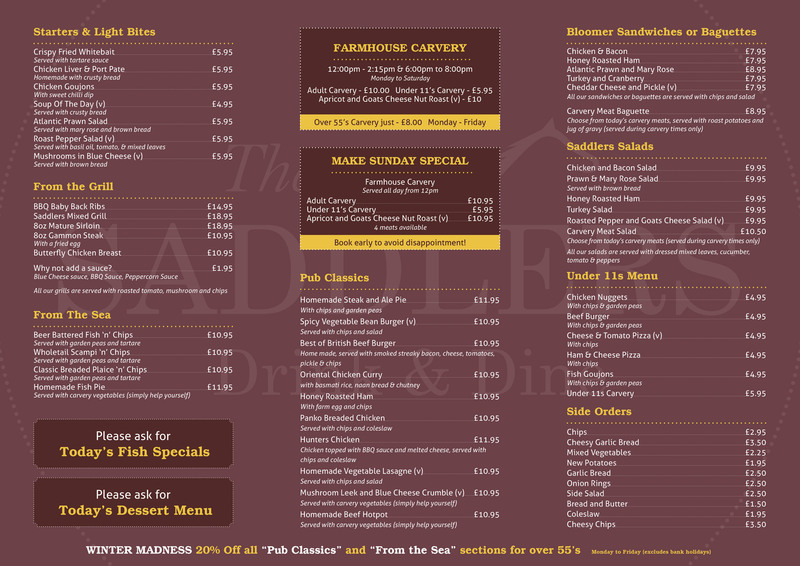 Enjoy delicious, freshly-prepared food and a wide selection of drinks all served in a friendly and vibrant atmosphere. Our helpful and approachable staff will ensure that your visit to The Saddlers is as relaxed and enjoyable as possible. At The Saddlers, we love what we do and pride ourselves on the service we offer! The Saddlers Wine and Dine has been under new ownership since the middle of November 2015.Our new manager, Tim Brookes, has come from The Bowd Inn, where he quickly established a reputation for good food and good service. He has already overhauled the menu and we invite you to come and try it for yourselves. The Webb family have been watching the downturn of The Saddlers for several years. In late 2015 the opportunity arose, in a joint venture with Heineken Brewery, to re-establish this 15th Century coaching Inn to its former glory. After being sympathetically smartened up, inside and out, we created a sense of calm modernity while still retaining the classic feel of a country pub. The relaunch in Easter 2016 has seen The Saddlers go from strength to strength. "The staff were very friendly , from front of house to the waiters/waitresses and the kitchen staff keeping up with the demands"
"Food was delicious, staff were nice and wish we were not going home on Saturday or we would definitely return." "Beautiful decor very old world but incredible.... Staff super friendly and very accommodating..."
"Just took the family for carvery, and seriously impressed with the fabulous food and service. Great atmosphere, delicious food, 12 types of vegetables (12!!!!)" "Paid a visit to the Saddlers and what a change since the last time well over a year ago. It is very apparent when a pub has a new manager who cares and the Saddlers is strong proof of that"
FOOD SERVED MONDay - FRIDAY 12pm - 3pm & 5pm -9pm & ALL DAY SAT - SUN!